When it came to illustrating the last blog post I did on this subject, I was surprised by how few images I had of them. I set out yesterday to correct that – on a cold and blustery day, that later produced snow: in April! Moreover, much of what I produced I realized today I could probably have got from Google Streetsview (I like the shadow of the camera on this one!). I think it is worthwhile spending some time on looking at what is there now, since much of the discussion is bound to revolve around how much of the existing structures can be retained. I will once again express my own preference for starting with a clean sheet. Far too much space in this part of town is devoted to moving – and parking – cars. Partly that reflects its recent history – it was after all a race track. And just as the Westwood track in Coquitlam had to make way for better uses, so did this one. It also seems to me a bit overly nostalgic to think that False creek can be brought back and the old Georgia Viaduct recreated. 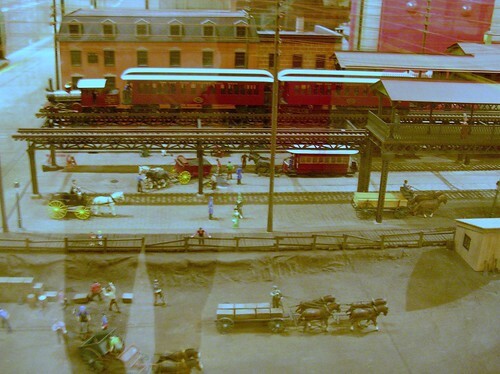 Model of one of the old NYC elevated railways as originally constructed. All were long ago removed due to the noise and gloom cast by the structures which ran down the middle of the avenues. I stated that I thought the viaducts ugly and despite what looks like a recent attempt to clean them I retain that view. 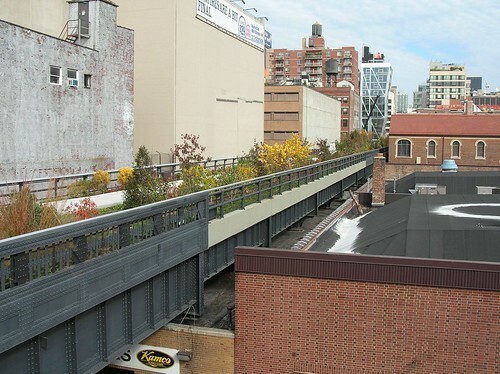 The High Line in Manhattan is quite a different object and has been much better absorbed into its environs over the years. Unlike the old passenger elevated railways this one was not over the street. It runs midblock, and is considerably narrower than either Dunsmuir or Georgia. The structure is quite a bit neater – nothing like as brutal as raw concrete. Neither of the present viaducts straddle the streets either – which accounts for the way that even though they are elevated the combination of the two means that large swathes of land are devoted to roadway. I tried counting the number of lanes of moving and parked cars north to south across this area – I make it 14 at some points. That is a significant take – and quite out of scale for the needs of the area. The whole philosophy that I would like to see applied (and not just here but what better place to start) is to reduce the amount of space available to the single occupant vehicle. The land that is not roads is not used for very much. Most of it is either paved or decidedly ramshackle. Perhaps the most imaginative use is the Skateboard park, though that is badly in need of refurbishment. It suffers because it was the first: other similar areas nearby have signs banning skateboarding. Will this need to be accommodated elsewhere – or has that already happened? 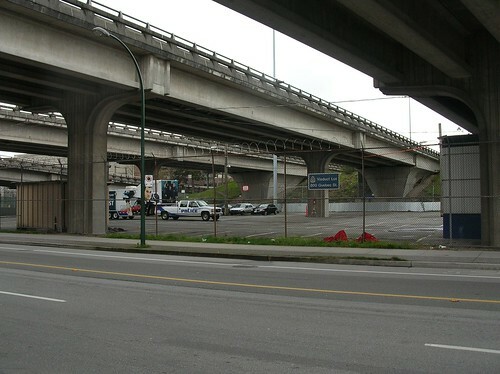 It is indeed about the only place under the viaducts that is not used for storing vehicles. And yes the cops do need somewhere to store their trucks. Though this does seem to be less than fully utilized. 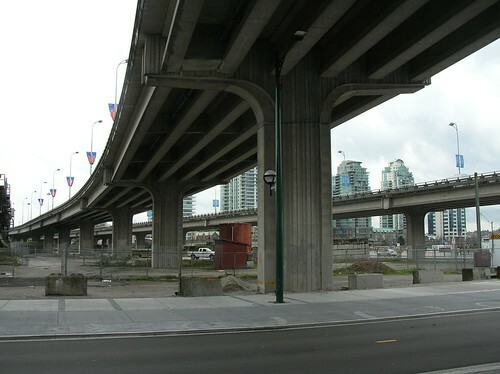 To get underneath the viaducts, the SkyTrain structure touches ground level. 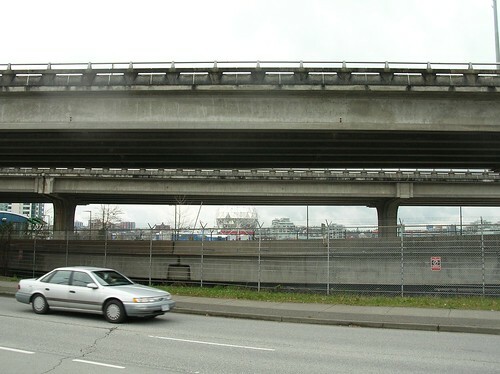 If the viaducts were removed, would the Sky Train be relocated? 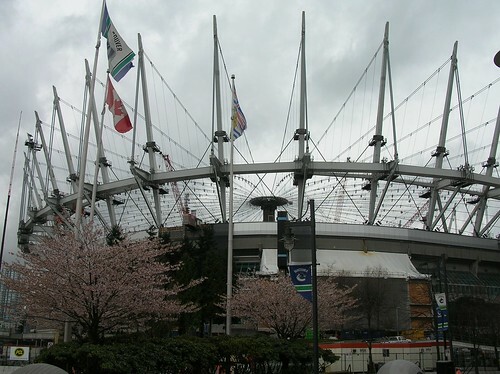 Could Vancouver cope without the combined Expo and Millennium Line services between Science World and Stadium while work was undertaken? Or would it be possible to keep a one track shuttle working while the other track was moved. At least Stadium has three platforms to allow greater flexibility. As far as I am aware Van City at Science World station is the only example of a building that utilizes the airspace above the SkyTrain right of way (although there is a new development in New Westminster that has put a canopy over the tracks). This type of development used to be greatly appealing. The development of Canary Wharf in London was designed around relocating the Docklands Light Railway, which was otherwise mostly on redundant arched structures abandoned by conventional and dock railways. 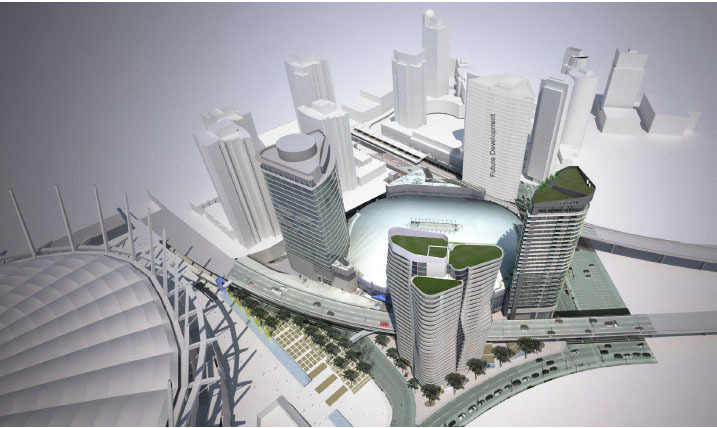 There was an iconic image of a train coming out of the middle of a building, which was supposed to symbolize the new dynamic future of Docklands. Of course, I can’t find that right now. 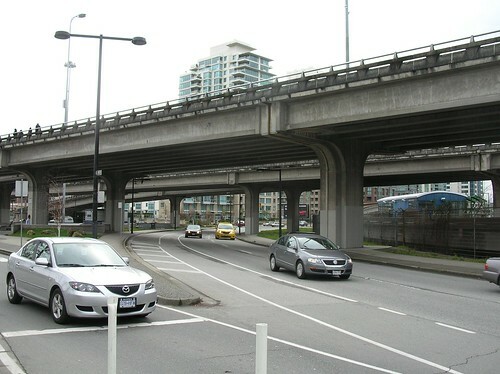 If the viaducts get taken down, the SkyTrain will remain – or might even get relocated, and there ought to be more opportunities for buildings on stilts like this around the elevated structure. Or even the bit at ground level. And of course the development community is already very active in the area. 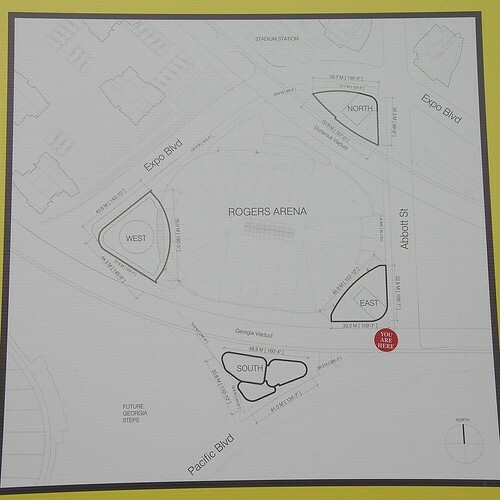 Aquilini is proposing three residential towers with an FSR of 4.3, in addition to the already approved 22 storey office tower, in the immediate vicinity of Rogers Arena. And there is the controversial development proposal around BC Place which includes a massive casino development to help pay for the new roof which Vancouver Council has now rejected. 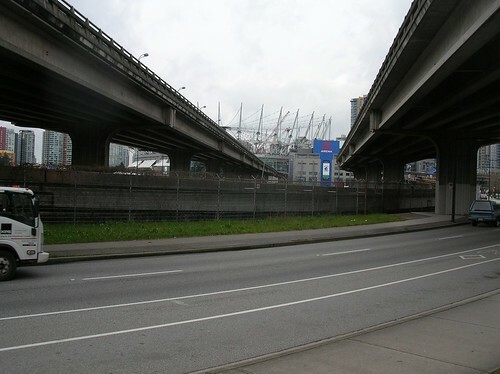 The Google shot should be extended south to False Creek and north to Pender St to portray the extent of the land parcels the viaducts override. These lands are extensive and are currently the focus of the Northeast False Creek planning process which state that 7,000 to 10,000 people may live there one day, hopefully mixed with commercial / retail zoning and better quality energy efficient architecture. This is the only possible direction Vancouver can direct its downtown growth toward before it leaps over salt water. Some say the removal of the viaducts is a separate distraction pushed by one Vancouver councillor (Geoff Meggs) who was infected by the War on the Car virus, but a quick glance at the land affected by the viaducts (see last paragraph) indicates this is an important land use issue. Your observations, Stephen, of the number of traffic lanes is telling on who won the war so far between cars and human beings. It seems to me than Pacific + Expo Blvd can be extened to Main Street as one road with very generous boulevards and median, possibly with inclined ramps to Georgia and Dunsmuir, but only if necessary. Georgia could swing around the arena over Abott St and join Dunsmuir in a loop that provides no vehicular connection to the flats below. The Vancouver streetcar project is slated to be routed up Quebec St through Chinatown to Cordova, then west to Stanley Park. Another leg is slated to swing west on Pacific to at least Homer, then west on Drake to Granville. With a little imagination one can foresee these lines joining at Stanley Park to complete a circle. Having lived in Strathcona I can empathize with the neighbourhood’s generation-old aggravation with suburban traffic severing their community. 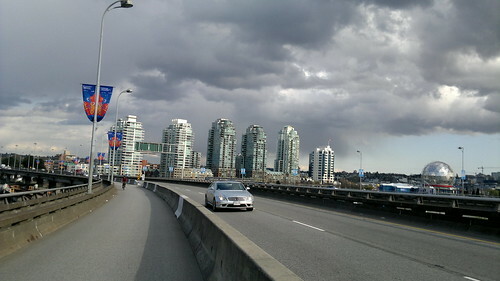 The traffic really does peter out once you get to Venables and Victoria, and in no way justifies keeping the viaducts. There are alternative parallel routes. In all cases, I hope to see the viaduct structures torn down and the overshadowed land daylighted. Most of all I’d like to see a great high-density community arise from the rubble with great public streets, parks, waterfront amentities, and public art — such as leaving one viaduct column standing as a monument to past urban follies. 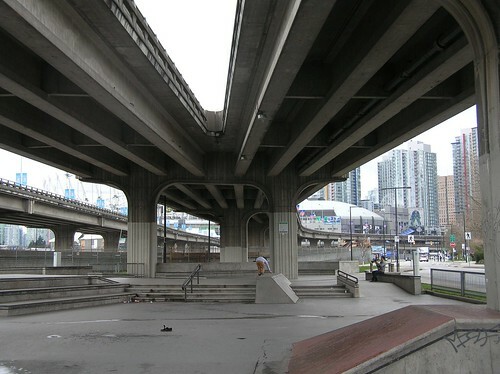 Your pic of the VanCity Building (the bank branch) provides a good example of how the space under the viaducts need not be “wasted” and can be built on while the viaduct remains overhead. This project provides an excellent example of how a [lowrise] project can be built under and around (if not above) an elevated structure. In this case, the project is a shopping mall, while the highrise condo tower are adjacent to the guideway. Hmm – I don’t know how that video link appeared directly in the thread. I just meant to include the website link. You can convert it to a link if you don’t want the video showing directly. anyway buildingd need to be far appart enough to provide light. In the aquiline case, you can see that the viaduct are not consuming Real estate space: it provides just a constraint to where to put distance between building. I read an article several years ago that VanCity and the contractor who built its Main Street Station tower would never do it again. This is because of the onerous bureaucracy and major delays the transit authority imposed on the project. 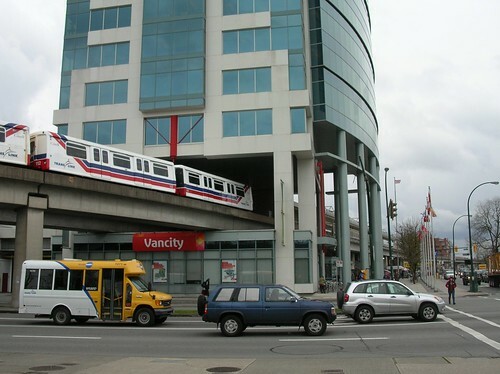 Building under a SkyTrain guideway is a no brainer, but if one is to have a rail line go through a building (a cool idea on its own), then it’s best to put the building up first before building the line. I’d bet a loonie the developer in the clip saw the writing on the wall and stayed away from building over the NW Station. Luckily, the grades greatly assist in this design, though it’s architectural quality from what I could determine is nothing to write home about. The bus tunnel is hideous and will no doubt fill up with particulates from diesel fumes. Ity would be better to leave them on the street in my opionion and provide more retail. Building under the viaducts is another matter. That would only reinforce them as a barrier. Building under the viaducts would reinforce them as a barrier in the same way that ANY building built on those blocks would prevent crossing mid-block or seeing through the space. If anyone thinks that taking down the viaducts would magically result in even more open (needle infested) parkspace in the area is dreaming. The land would be built on – the same way that any other open parcel of land will be built on in the area. That’s what the developers want – and like Voony alludes to – is that going to bring “daylight” to the area or just create another shadowy canyon (albeit without the “terror” of the automobile?